From the wintry thicket of sallows across the river come two silvery notes, in colour like the March sunshine itself, repeated several times in succession, rising and falling in an irregular and unpredictable cadence. The sound, noticed just a moment ago, brings with it a surging feeling of freedom and release, as if a long and tedious series of obstacles had finally been overcome. The first chiffchaff has arrived, so it must be true: spring is here, and that really means that winter has gone at last. Presently you manage to glimpse the bird, a small, slight warbler with dark legs and a faint eyestripe, the plumage dusky olive above and lighter below. It is flitting about in the branches near the water, tirelessly searching for small spiders and insects, which it takes with a deftness and delicacy almost too quick for the eye to follow. The song is abandoned; the chiffchaff has become more absorbed in its feeding, and flits now to an elder bush whose oily, dark-green leaves are already well out. The bush holds no interest, and the chiffchaff moves on a few yards to the north, to the red-stemmed dogwood thicket, where it again begins to sing. Chiff-chaff, chiff-chaff, chaff-chiff, chiff-chaff. But “chiff-chaff” is too harsh a way to represent the song. The Germans call the bird “Zilpzalp”, pronounced “Tsilptsalp”, which comes a bit nearer the truth, though the notes, like nearly all bird sounds, are impossible to render accurately in any human scheme of phonetics. Later in the spring the song will be heard away from the river, in woods and wooded scrub, well-timbered parkland and gardens, but the earliest arrivals nearly always appear by water. Although one or two chiffchaffs frequently spend the winter along this stretch of the Colne, this bird, with its song and the way it is progressing from bush to bush northwards, is almost certainly a migrant. The chiffchaff is usually the first in the annual tally of our local summer visitors. A day or so later comes the wheatear – scarcely to be found in this district now, unless sometimes on the broad arable fields above West Hyde; next, the willow warbler, outwardly almost identical to the chiffchaff but with a completely different song; next, the sand martin, tree pipit, and yellow wagtail; and then, in quick succession, the swallow, blackcap, house martin, and all the rest, ending with the turtle dove, normally the last of the common migrants to arrive, in the latter days of April or the first of May. Most of these birds winter in Africa, some as far south as the Cape. How they manage to navigate is still not properly understood. Some species, the blackcap, for example, have been shown definitely to take their bearings from the stars. All can steer by the sun and have the acute sense of time which this necessitates. It is believed by some scientists that certain species have an inbuilt compass sensitive to the earth’s magnetic field, though no one has yet found any tissues which might perform such a function. A compass would certainly explain some of the more spectacular feats of bird navigation, in fog or on cloudy nights; but then, these are the very conditions most likely to confuse and disorientate most migrants. Leaving aside the technical difficulties of nagivation, the main problem for migrants is the sheer expenditure of energy needed to complete the journey. Larger birds, such as eagles and storks, which have wide, high-efficiency wings, are able to climb to altitudes where they can take advantage of the wind. 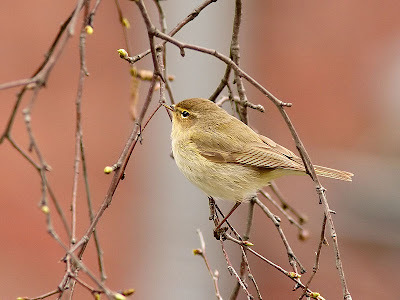 Small ones, though, like the chiffchaff, tend to progress yard by yard on the ground, and this method of travelling is called “bush-to-bush” migration. Set against all the difficulties and dangers of migration, the advantages to the species are very great. It is able to breed in latitudes which, uninhabitable in winter, have immensely long summer days compared with those nearer the equator. At midsummer in England there can be as many as eighteen hours of daylight in which to find food for the young. This enables more and larger broods to be raised, and the increase in breeding success must outweigh the losses of adult and immature birds on the spring and autumn migrations. Our chiffchaff this morning has probably wintered no further away than the Mediterranean. Nonetheless it has had to cross the whole of Europe and, worst of all for such a small land-bird, the English Channel. Having made land on the Hampshire, Sussex or Kent coast, it has moved steadily northwards, following wherever possible the river valleys, which are both sheltered and provide the most abundant supply of early insects. Yesterday or the day before, some combination of landmarks in the broad valley of the Thames near Staines directed it northwards along the Colne. Twenty miles later it appeared here. Now it has passed on, several hundred yards upstream. The urge to move north and breed is irresistible, of a pattern with the daily increase in the power of the sun. Having been silent for a while, the bird is heard singing once more, faintly, a new arrival at some fresher and more northerly stretch of the river.